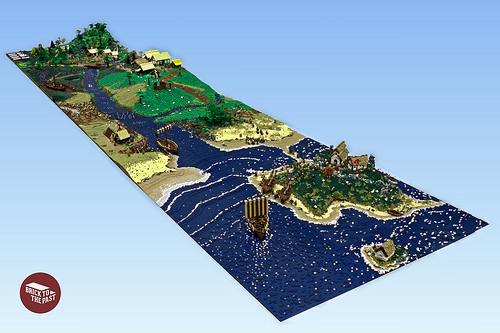 The Summer Joust contest is generating some amazing LEGO builds in a variety of categories. 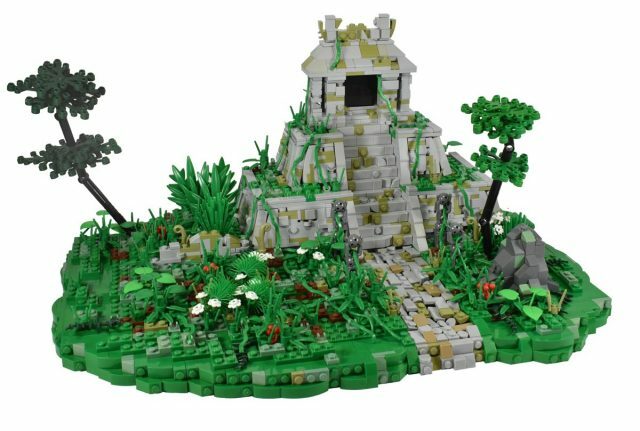 Talented multi-theme builder David Zambito‘s entry in the “Mesoamerican Setting” category depicts an Aztec-style temple overgrown with foliage. While the well-built temple is the center of the scene, the landscaping also deserves your attention. The plants are built not just from actual LEGO foliage pieces like bushes, bamboo, and flowers, but also from the plastic sprues that three-leaf plants come in, as well as street sweeper brushes. 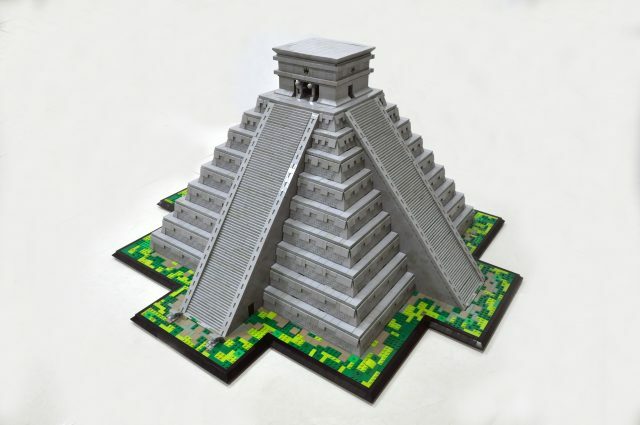 If you like this Aztec-style pyramid, you might also like the Maya-style LEGO pyramid we featured previously. 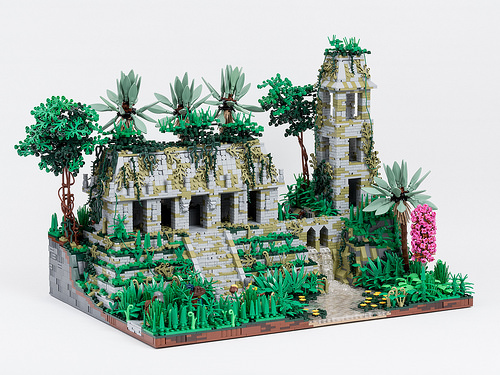 Even though this ruined Mesoamerican temple by Jonas Wilde doesn’t depict any particular site, it’s clear Jonas was inspired by the amazing Mayan structures of the Classic Maya era (250-900 AD). Jungle foliage drapes itself over the building, while palm trees sprout from the platform. The composition of this LEGO build is stunning, with the scene built on a platform that includes cutaway views of earth and stone, and a variety of heights that accentuate the detailed flora. In 1983, UNESCO designated the legendary Peruvian citadel of Machu Picchu as a World Heritage Site. Located in the Sacred Valley, 50 miles northwest of Cusco, the city was constructed around 1450 at the height of the Inca empire and was abandoned just over 100 years later. At time of writing, the LEGO Architecture theme has yet to feature a South American structure or building. 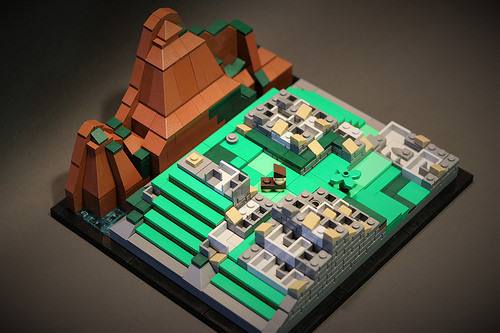 This omission prompted Diego Baca to build his own microscale version of this historic site. Diego has captured all the key features including Huayna Picchu as the mountainous backdrop, the blue of the Urubamba River glistening on the left, and la piedra sagrada [tr. the sacred rock] represented by a single 1×1 round plate sitting on high. Also note the wandering llama in the middle of the site! 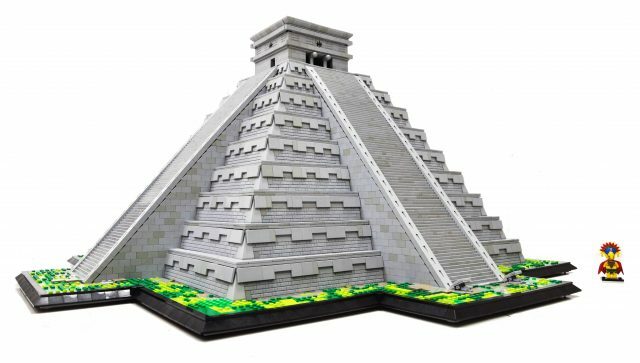 Diego has kindly created PDF instructions for this model in the same style as the official LEGO Architecture instructions, with a few pages of photographs, historical information, and step-by-step building plans. As I wrote in introducing ArzLan’s LEGO Petra, I spent the summer of 1994 on an archaeological dig in Jordan, and visited Petra for one memorable weekend. Both Petra and Jordan as a whole remain one of the highlights of my life. 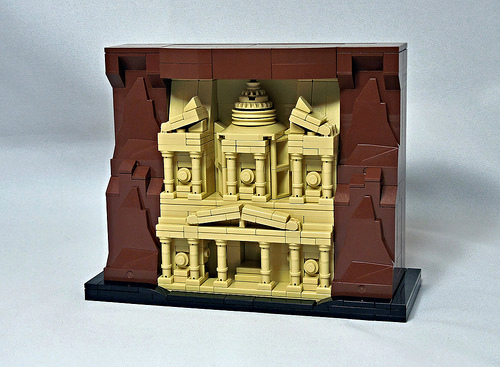 Legranger Absurde has built a lovely microscale version of Al-Khazneh, the “Treasury” (actually an empty tomb), that greets each visitor to Petra as they emerge from the winding gorge called the Siq. My one critique of this excellent LEGO model is that the sandstone geology of Petra is nearly as spectacular as the many structures carved into the rock face. 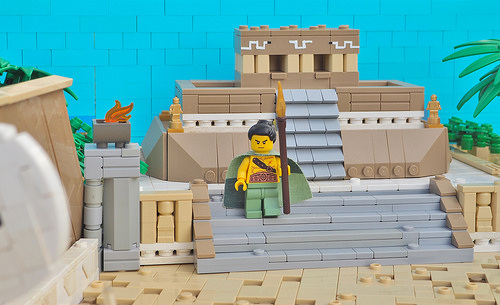 Although building a detailed tomb using varying shades of tan and red might not have been achievable, plain brown LEGO for the surrounding rocks seems like a lost opportunity. Al-Khazneh is, of course best known as the entrance to the fictional, trap-filled obstacle course leading to the Holy Grail in Indiana Jones and the Last Crusade. The facade is the most spectacular thing about the tomb — the interior is just an empty square chamber, though the acoustics are great for singing. Want an Egyptian mummy of your own? 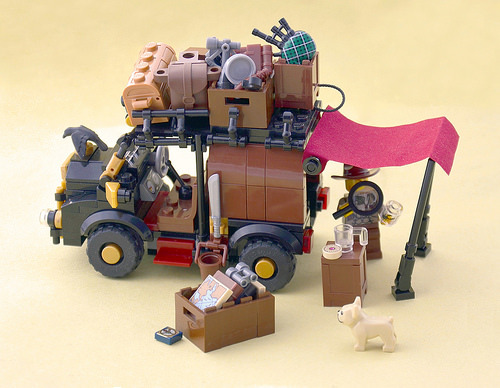 Build it from LEGO! 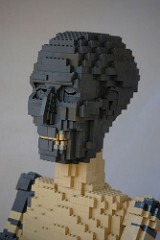 We’ve come to appreciate the amazing brick-built animals created by AnActionfigure — each one has seemed more life-like than the last. 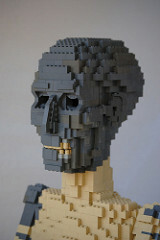 But life would not be life without death, and so I was quite pleased to see the builder’s take on an Egyptian mummy. I’ve seen a number of mummies, not least of which the great Ramses II himself in the Egyptian Museum in Cairo, and AnActionFigure has captured the look of a mummy wonderfully, from desiccated flesh and exposed bone to the linen wrappings. If that’s not creepy enough, the mummy’s eyes open and close with a switch at the back of its neck. 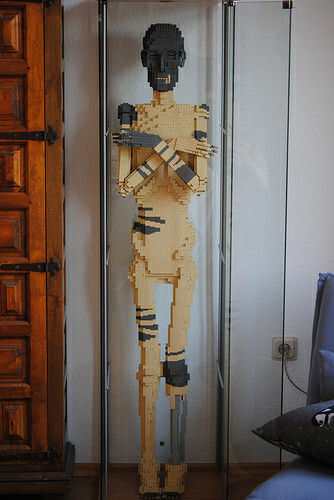 We’ve see plenty of LEGO mosaics before, but this one has a twist. 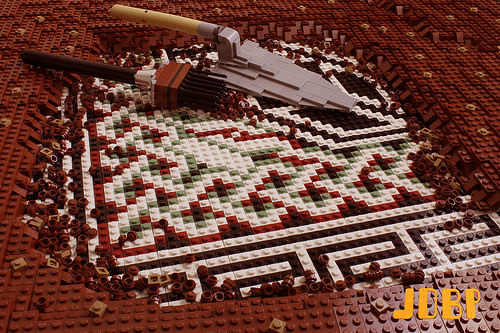 James Pegrum used LEGO to capture the archaeological discovery of a Roman floor mosaic. 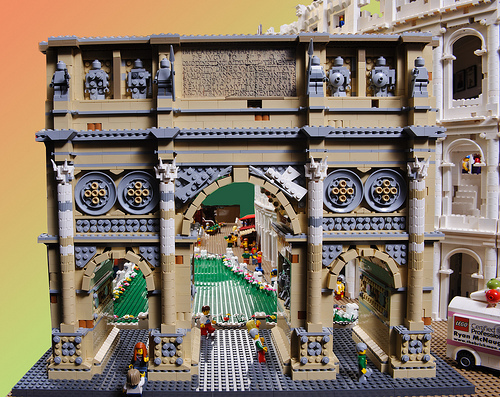 This is a teaser for a Romano-Celtic themed collaboration by British building collective Bricks to the Past, due to be unveiled at STEAM next month. Can’t wait to see what other gems are unearthed when the full display is revealed! 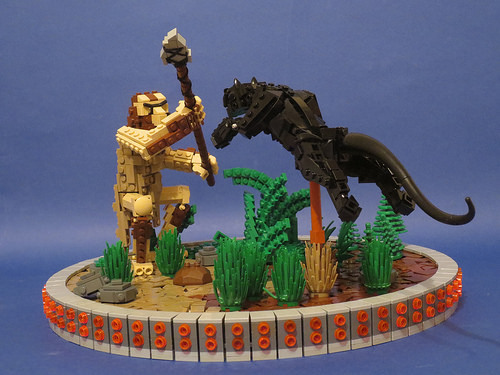 Built for the MOC Olympics contest in a round focused on human evolution, Deus Otiosus created this scene depicting one of our forebears about to become a cat’s lunch. The sculpture and posing of both characters is perfect. And as an added bonus, you can even enjoy this build from all angles thanks to a handy spinning animated version. 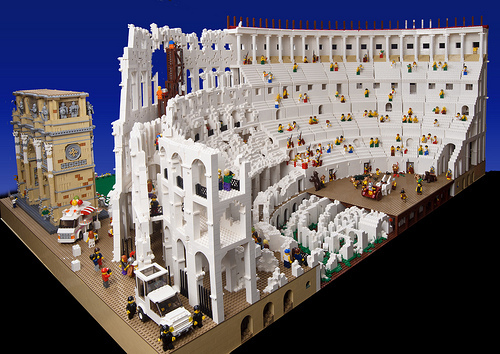 The archaeological purist in me had initially passed this up because it’s white (versus the tan-hued limestone and weathered brick of the real thing), but the Internet has convinced me that this LEGO Colosseum by Ryan McNaught — whose equally epic Saturn V rocket we highlighted earlier this year — is too epic to ignore. Ryan’s Colosseum is split into modern and ancient halves, with a ruined structure on the left and a shiny new amphitheatre populated by entertained Romans on the right. Check out lots of photos (many with great little scenes of daily life in modern and ancient Rome) in Ryan’s photoset on Flickr.